EMU industrial output spurted by 1.5% in November, more than expected but only after October's dismal 0.1% gain. The headline series (EMU IP excluding construction) shows a weaker growth rate 3.4% over three months compared to its juiced up 6.1% pace over six months, but it is still faster than its 3.0% pace over 12 months. Manufacturing has roughly the same pattern except that the pace of three-month growth is weaker than 12-month growth. Consumer goods output growth rates have been pretty flat on these various horizons with durable goods output declining on all timelines and nondurables picking up and accelerating. Intermediate goods show trendless growth in the 2.4% to 4% range over these various horizons while capital goods output advances by 3% year-on-year, accelerates to 6.5% over six months, then slows and actually declines at a 2.7% annualized rate over three months. Even so in the quarter-to-date (Q4, with one month yet to post), it is the capital goods sector where output gains have lead the way on a 6.4% annualized pace followed by intermediate goods at a 3.8% pace and trailed by consumer goods where output is falling at a 1.1% on declines in both durables and nondurables but led by weakness in durables. Germany has reported out its preliminary GDP number for 2016 and it has logged 1.9% growth, its best in five years. NIESR (National Institute of Economic and Social Research) estimates U.K. growth at 2%, a slight deceleration from 2015. Still, BOE Governor Mark Carney suggests that its own outlook may be ready for an upward revision soon. On balance, growth is ending the year on an up-note in Europe. This is shifting attention and focus to the ECB where the mood seems to be that the upturn is not yet convincing and at the same time that means that the inflation pick-up is not yet compelling. Country by country data show us output declines in November in only four of 11 of the earliest EMU members. 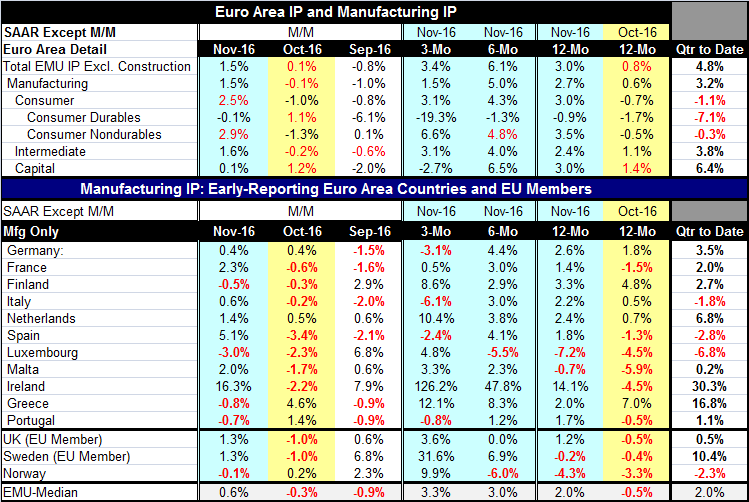 This is a sharp upgrade from October when output fell in seven of 11 nations; September saw output declines in six countries. The monthly data are somewhat volatile and serve to remind us that growth is weak. That is why normal volatility can produce so many negative monthly dips. But output declines per se seem to be less of a worry as European growth has been stabilizing. Over three months only four countries showed declines; over six months only one country showed an output decline; and over 12 months only two EMU members in this table show declines and those are for very small economies, Luxembourg and Malta. The industrial data for November are reassuring. The read on German GDP is also good news. But there is not yet a sense that Europe is out of the woods. There is an ongoing OPEC oil price rise whose effects need to be monitored. Inflation rates are being recorded higher across the spectrum of reporters, but this is the oil effect in progress not flaring inflation per se. Brexit fears still seem to ebb and flow. As 2016 data draw to a close, the euro-economy seems to be doing better. Growth seems more solid and inflation is rising. It is setting up expectations for a policy shift at some point in 2017... for some a shift that will come sooner, for others, at a date yet to be determined.